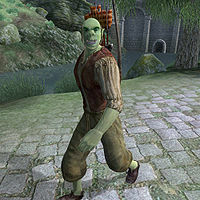 Bazur gro-Gharz is an Orc thief living in Cheydinhal. He is a member of the Orum gang, a local skooma-ring with Camonna Tong ties headed by Dulfish gro-Orum. While prominent gang member Oghash gra-Magul takes care of the Skooma dealing and selling, the rest of the gang spends their time wandering around Cheydinhal, doing absolutely nothing but relax and cash in when Oghash returns from her many expeditions. Bazur is no exception: he sleeps in his house every night between 2am and 8am and always starts the day with two hours of wandering on the second floor. At 10am he equips his bow and arrows and pays a visit to another gang member, namely Borba in her store Borba's Goods and Stores. He leaves the store at noon and enters Newlands Lodge for a two-hour breakfast in the company of Oghash, Dulfish and the last gang member, Magub gro-Orum. He returns to his house at 2pm and strolls around on the second floor for six hours. At 8pm he returns to the Lodge and hangs out there until 10pm when he heads back home for a bit of relaxation before he leaves once again at midnight, this time for a nightly stroll near Magub’s house in the center of Cheydinhal. At 2am he heads back to his house and goes to bed. Bazur wears a lower-class outfit consisting of a patched vest, sack cloth pants and a pair of rough leather shoes. He wields an iron dagger, an iron bow and an infinite supply of steel arrows. He also carries his house key and a few pieces of gold. A bit more talkative than the other gang members, he will still act pretty hostile towards you: "Yeah! I'm Bazur gro-Gharz. I got protection from the Orum Gang. So don't mess with me. Or they'll fillet you real good." If you ask him about the city, he will tell you a bit more about the gang: "Boss uglies in Cheydinhal are the Orums. Don't mean nothing to you. You is the Outside. Just stay Outside, and everything's Mister Tinker. Got me?" Bazur is the owner of two paint horses - one in the city stables, and another in Brindle Home. The horse in Brindle Home seems to be a mistake on the part of the developers, who appear to have copied and pasted the Cheydinhal Stables cell without changing ownerships. Esta página foi modificada pela última vez à(s) 05h03min de 26 de abril de 2013.